Biodiesel is a diesel fuel substitute made from a variety of oils, fats, and greases. Biodiesel, a diesel fuel substitute that can be made from a variety of oils, fats, and greases, is of interest to farmers for a number of reasons: It can provide an additional market for vegetable oils and animal fats; it can allow farmers to grow the fuel they need for farm machinery; and it can decrease U.S. dependence on imported oil since fuel feedstocks can be grown domestically. Biodiesel is a renewable source of energy that can help reduce greenhouse gas emissions and minimize the “carbon footprint” of agriculture. It contributes less to global warming because the carbon in the fuel was removed from the air by the plant feedstock. Rapeseed is a popular oilseed crop in Europe and Canada. Commonly used feedstocks for the production of biodiesel include soybean, rapeseed/canola, used (waste) vegetable oils, and tallow (animal fat). 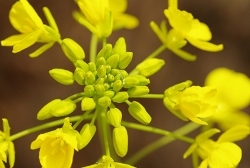 Mustard biodiesel is being studied at the University of Idaho, and Montana State University is conducting research on camelina for biodiesel production. Safflower, sunflower, and hazelnut produce oil that could be used for biodiesel. Warm climate tree oils such as palm oil and jatropha are used as biodiesel feedstocks in some parts of the world. Feedstocks for biodiesel are generally chosen based on price and performance. Some are better for cold temperature conditions. All the above feedstocks have alternative uses and markets, so the prices can fluctuate depending on demand. Biodiesel is also not the same as bioethanol. Bioethanol is an alcohol made from fermented sugar and is designed to be used in engines that run on gasoline. Biodiesel, on the other hand, is made to be used in engines that normally use diesel fuel. Biodiesel is made by reacting vegetable oil or animal fat with an alcohol (usually methanol or ethanol) and a catalyst (usually sodium hydroxide or potassium hydroxide). This process separates the glycerin from the oil or fat. 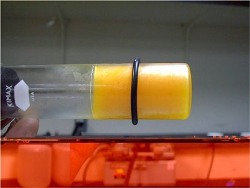 The resulting product, biodiesel, is thinner than the original oil or fat and thus works better in a diesel engine. For more information on how biodiesel is made, see Biodiesel Production Principles and Processes. Biodiesel is an accepted fuel and fuel additive in the United States and around the world. It is registered as a fuel with the Environmental Protection Agency. The National Biodiesel Board lists over 200 firms that produce biodiesel commercially in the United States and Canada. Hundreds of governments, national parks, school districts and utility companies in the United States use biodiesel blends to run their fleets. The term “biodiesel” refers to 100 percent pure fuel, designated as B100, that meets the American Society for Testing and Materials (ASTM) requirements for biodiesel fuel in its D6751 standard. The term “biodiesel blend” refers to a blend of pure biodiesel with petro-diesel, typically represented by the letter B followed by a number. The number refers to the volumetric percentage of biodiesel. Biodiesel can be used in standard diesel engines in any percentage — from B1, which is 1-percent biodiesel mixed with 99-percent petro-diesel, to pure biodiesel, known as B100. Pure biodiesel or fuels with a high percentage of biodiesel will gel at low temperatures. Cold temperatures can be a problem for high-percentage blends of biodiesel. B100 made from soybean oil will cloud at temperatures slightly above freezing and can clog fuel filters if the temperature drops below 28˚F. Biodiesel blends with diesel fuel are preferred in such conditions. Because biodiesel is a strong solvent, it will probably loosen debris in pipes and tanks, clogging filters initially. Remedy this problem by changing filters soon after first use. Sometimes rubber hoses and gaskets on older vehicles don’t hold up well with B100. Pre-1991 vehicles should be monitored for hose degradation or seal weepage. If these occur, the hoses and seals should be replaced with viton-based parts. 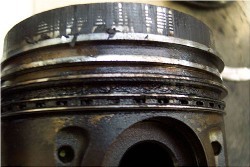 Engine warranties are not affected by the use of biodiesel, although dealers are frequently confused on this point. Manufacturers’ warranty statements only cover the parts and assembly of the engines and never cover problems caused by the fuel, regardless of whether the fuel is petroleum-based diesel or biodiesel. Questions about liability for damages caused by a specific fuel should be addressed to the fuel supplier. See the National Biodiesel Board’s Standards and Warranties page for more information. Since 2006, petro-diesel fuel used for highway transportation in the United States has been required to contain less than 15 parts per million of sulfur. The processing to remove the sulfur from petro-diesel decreases the fuel’s lubricity. Biodiesel is an excellent lubricator. As little as 1-percent biodiesel added to petro-diesel will improve the fuel’s lubricating properties and thus will help diesel engines to last longer. Sheehan, J., Camobreco, V., Duffield, J., Graboski, M., and Shapouri, H. (1998). Life Cycle Inventory of Biodiesel and Petroleum Diesel for Use in an Urban Bus. Golden, CO: National Renewable Energy Laboratory, U.S. Department of Energy, NREL/SR-580-24089. See at a glance all the biodiesel articles in the Farm Energy section. A wide variety of vegetable oils can be used for biodiesel production. Currently, edible rapeseed oil — called canola in the United States and Canada — is the dominant feedstock for biodiesel production in Europe, and soybean oil is the major feedstock in the United States. Other plant oils, such as mustard, safflower, sunflower, cottonseed, camelina, jatropha, and hazelnut have been researched and used for biodiesel production. Click here for details. Small-scale biodiesel producers can purchase vegetable oils to process into biodiesel or can extract oil from crop seeds. Producers who decide to extract oil from crop seeds need specific equipment. This article provides basic information on seed preparation, oil extraction and oil processing for small-scale producers. Click here for details. How do common biodiesel feedstocks compare in terms of yield and prices? This chart gathers information from many different sources to allow readers to compare feedstock yields, oil yields, biodiesel yields, and prices of oil and commodities. Used and waste oil and grease are among the most environmentally sound biodiesel feedstocks. While the cost of these feedstocks is generally low, producing biodiesel from these feedstocks can be challenging. Click here for details. Animal fats are low-cost biodiesel feedstocks. However, there are some drawbacks and challenges to animal fat feedstocks. Click here for details. In order to make quality fuel in a safe manner, biodiesel producers must have a good understanding of the underlying chemistry of the biodiesel process. This article presents a simple lesson in the chemistry of biodiesel, and includes a list of links for more detailed information on biodiesel production. Click here for details. Biodiesel production does not result in a lot of waste. However, the process does produce some wastewater, minerals, resins, and/or solids filtered from used oil. This article discusses how biodiesel producers can handle these waste products. Click here for details. Biodiesel is a relatively safe product. It is considered nonflammable and biodegradable. However, the components to make biodiesel can be hazardous in some situations. Biodiesel production often involves methanol,which is flammable and can cause blindness and death if ingested, and strong caustics, which can cause chemical burns, blindness, and death. This section includes information on safe handling of alcohols, strong acids and strong bases, as well as safe practices in the laboratory. Click here for details. Biodiesel is a good alternative fuel for diesel engines. It can be used in any standard diesel (compression-ignition) engine with no modifications, at any blend level from B1 to B100. Low-level blends have been mandated in some states, such as Oregon, Washington and Minnesota, as a lubrication improvement agent. One of the benefits of using biodiesel in diesel engines is its much lower tail-pipe emissions. Click here for details. Fuel quality is important to consumers. Due to its nature, biodiesel has different properties than petro-diesel. These properties include cold flow characteristics and oxidative and storage stabilities. A voluntary BQ-9000 Quality Assurance Program is available for biodiesel producers to help ensure fuel quality from production through transportation and storage to final use. Click here for details. Newly produced biodiesel that leaves the plant in good condition can become unacceptable during distribution without proper care and attention. This article provides an overview of storage and transportation requirements for biodiesel. Click here for details. Production economics vary with scale and circumstance but include the cost of feedstock production, or collection/purchase, oilseed processing, alcohol and catalyst, equipment, labor, electricity, building, safety and lab equipment. These costs may be offset by potential federal incentives. Click here for details. How much energy does it take to produce biodiesel, compared to the energy in the fuel itself? And what is the total environmental impact of biodiesel production? These questions can be answered using a technique called “life cycle analysis.” Sometimes referred to as “cradle-to-grave” analysis, life cycle analysis (LCA) is a tool used to account for inputs and outputs to complex systems. This section includes information on the energy life cycle analysis of biodiesel. Click here for details. Energy life-cycle analysis (EgLCA) accounts for the amount and type of energy used in the production of a fuel and compares that to the amount of energy contained in the resulting fuel. The process is also called “energy life cycle assessment.” Click here for more details. Is biodiesel an environmentally friendly fuel? How do the greenhouse gas emissions of biodiesel compare to petro-diesel? Environmental Life Cycle Analysis can help answer such questions. Click here for details. Vegetable oil fuels have been used in engines since 1900, but few people were interested in using fuels based on vegetable oil or animal fats until the oil embargo of the 1970s. This article traces the history of biodiesel, the rapid recent growth of the industry, and possible future paths. Click here for details. Does the production of biodiesel cut into food production? This article presents various points of view on the issue. Click here for details. Some people worry that as demand grows for biofuels, forests and wetlands will be cleared because of the increased need for cropland to grow more biofuels feedstock as well as food. This article presents both sides of the debate. Although the debate has focused mostly on ethanol, biodiesel is sometimes implicated as well. Click here for details. Use of biodiesel and other biofuels may help reduce greenhouse gas emissions because the carbon these fuels release into the atmosphere was captured recently from the atmosphere by the plant feedstock. However, if forest or wild land is cleared for the production of biofuels, this can release more carbon into the air than is captured by the plants. Click here for more information. Microalgae can produce a large quantity of oil in a small area and can be grown in deserts and other harsh environments where crops will not survive. Research into microalgae biodiesel is in its infancy. Click here for more information. Definitions of common words associated with biodiesel.